Fits 7.5" and 8.8" solid rear axle Mustangs from 1979 through 2004. MM's Rear Upper Control Arm Bushing Tool makes it much easier to remove the old bushings and install these new bushings. Watch the video - Click on the Video tab above to see the tool in use. Replace differential side (aft) upper control arm bushings when installing new rear upper control arms on your solid axle equipped Mustang. Two bushings are included to replace the aft bushings in the axle/differential housing for each upper arm. The bushings are pressed into Mustang 7.5" and 8.8" axle housings using our special tool. The chassis side (forward) upper control arm bushings are integral with the arm. Never replace rear upper control arm bushings with urethane, due to induced binding, and resulting chassis damage. Upper control arms must rotate and pivot with axle motion, and rubber is the only material that sufficiently allows for this twisting without chassis damage. Our bushing removal and installation tool (MMT-1) makes the replacement of this bushing very easy. Given that the last Mustangs using these bushings (2004 model year) are now well over 8 years old. 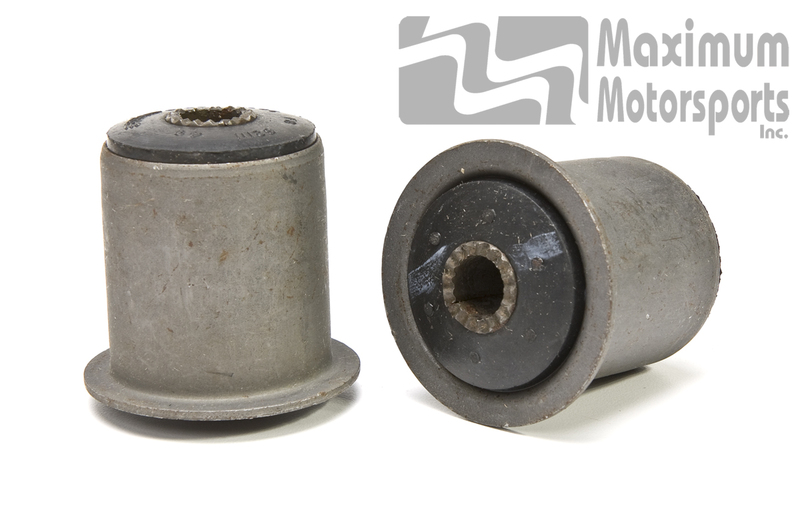 Your Mustang is due for replacement of these bushings, especially if you do any track or performance driving. If you haven't yet converted to a torque arm (which eliminates the upper arms entirely), these are the only upper control arm bushings we recommend. We have two sources for these bushings: Ford, and a trusted vendor. Our engineering staff has determined that both sources deliver bushings from the same manufacturer, and bushings from both sources are of equal quality. Bushings are intermingled when stock is rotated with each new delivery, so we are unable to tell the purchaser which source their bushings are going to come from.